Please join Pastor Aubrey and Gwendolyn Hayslip and the members of Everlasting Covenant Community Church of Central Florida as we celebrate our 4th church anniversary with a special service on Sunday, June 1, 2014 at 3:30PM. Come to celebrate the the vision that God has given to us and His power to accomplish great things from small beginnings. Come celebrate with our special praise and worship, divine praise dance ministry and with an anointed man of God as our guest speaker, Bishop Ronald. F. Kimble of The Life Center Church of Eatonville, Florida. 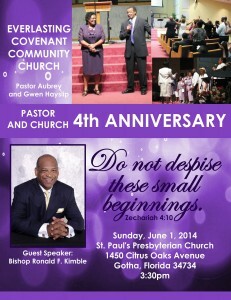 Come to hear an encouraging and passionate message on our anniversary theme ” Do Not Despise These Small Beginnings”. After our celebration service please make plans to join us in our Fellowship Dinner. If you can not attend please pray that all we do will bring honor glory to God, the Father. We look forward to seeing you. Please contact Gwen Hayslip (407) 905-9512 for more information.